Beginning in 1997, Richmond began to commemorate its jazz heritage with the completion of several murals on various buildings throughout the community. These murals were painted by an outstanding local artist, Pam Bliss Ferguson. Laurel Gennett Martin, wife of the late Henry Gennett Martin of the former Gennett Recording Company, presented these unique pieces of art to the community to further encourage Richmond to embrace its History of Recorded Jazz. Formerly seen at the corner of South 9th and South "A" Street, you'll now find the Jazz Mural titled "Remembering the Immortals" in Richmond's historic Depot District, on the west side of North 8th Street, between North D and E Street. 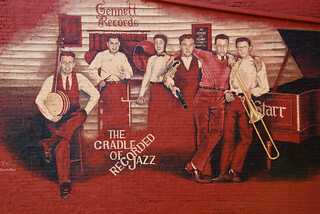 The Jazz artists featured on this mural are Bix Beiderbecke and his Rhythm Jugglers, Tommy Dorsey, Don Murray, Howdy Quicksell, Tommy Gargano and Paul Mertz. The picture has been dated to January 26, 1925. 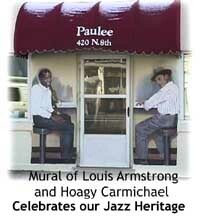 On the corner of South 8th and Fort Wayne Avenue, you will find this mural of Louis Armstrong and Hoagy Carmichael on Paulee's Restaurant. 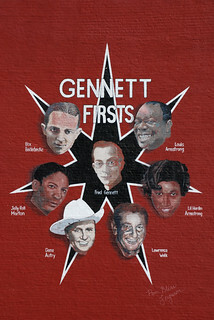 This next mural recognizes many of the recording artists that recorded at the Gennett Recording Company and also Fred Gennett, who was instrumental in bringing these artists to Richmond. It is located on the west side of the building at 911 North "E" Street and easily viewable from the railroad overpass on North 9th Street (U.S. 27 North). In the center is Fred Gennett. Starting at 1:00 and going clockwise - Louis Armstrong, Lil Hardin-Armstrong, Lawrence Welk, Gene Autry, Jelly Roll Morton, and Bix Beiderbecke. 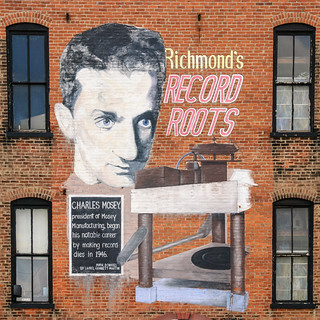 Honoring Richmond's record producing roots, a mural completed in June of 1999 by Pam Bliss Ferguson, features Charles Mosey. It is located on the north side of the building on Fort Wayne Avenue between North E and North D streets. It is easily seen by looking to the right when heading south over the railroad overpass on North 9th Street (U.S. 27 North). The wording on the mural says: Richmond's Record Roots. Charles Mosey, president of Mosey Manufacturing, began his notable career by making record dies in 1945. Mural donated by Laurel Gennett Martin. 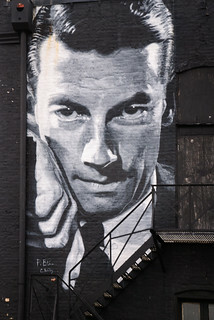 Visitors headed north on U.S. 27 through downtown Richmond will see a mural honoring Hoagy Carmichael, who recorded "Stardust" at the Gennett Recording Studio in 1927. Cradle of Recorded Jazz - the Starr Piano and Gennett Recording Company history.